At INBOUND we introduced a new, native integration with ecommerce leader Shopify. 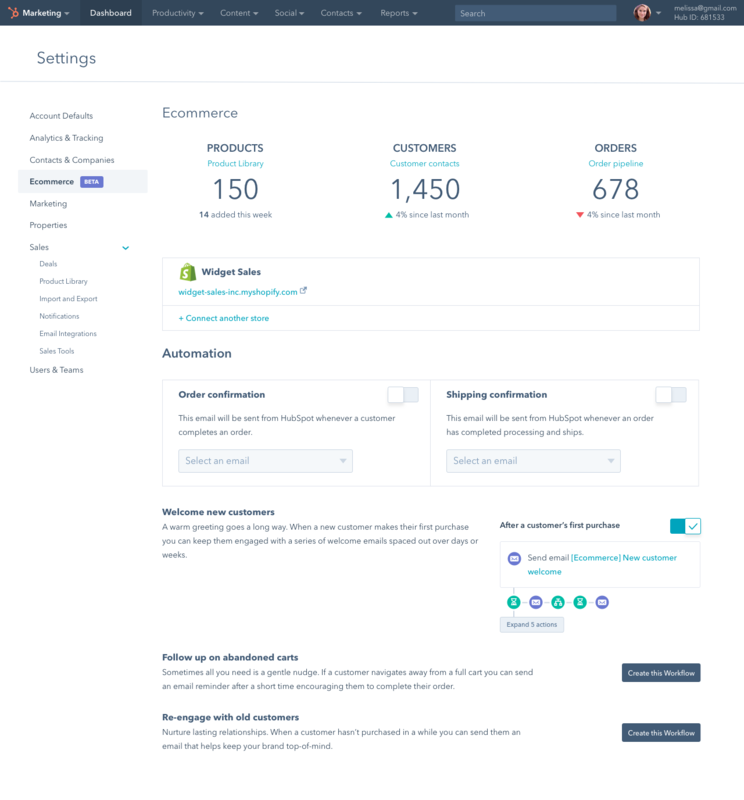 Now live, this new HubSpot built integration allows shared customers to seamlessly integrate Shopify and its data (customers, orders, and products) into HubSpot. This update eliminates any need to manipulate HubSpot to work for ecommerce and enables new automation, reporting, customer marketing, and other sales and marketing tactics ecomm customers want. For customers who aren’t on Shopify or don’t want to switch, we’re introducing Ecomm Bridge. A new set of API’s built specifically for the ecommerce use case. Bridge gives technical teams an official and streamlined way to connect online stores to HubSpot. Like the integration Bridge is currently in a beta and will roll out over the coming weeks. Don't have HubSpot? Get a demo of the Shopify integration. Shopify is the leading ecommerce platform for businesses who want to sell online. They make it easy to build an online store, get paid quickly and securely, and do business on mobile. Shopify integration Timeline: This integration is now live in HubSpot, you can find it in the internal integration listing in the face menu. Bridge Timeline: These APIs are currently in a limited beta. We’ll be expanding the beta in the coming months. Why should Ecom Marketers be excited about this and the addition of inbound to their marketing mix? Once integrated - either through Shopify or Bridge - ecommerce marketers will have access to the following features. Via the new integration or Bridge you will have a unified integration between you online store and HubSpot. You'll be able to turn customers into contacts, orders into deals, and a new object Products will be available. 2) Marketing Automation for ecommerce. With HubSpot you can use your ecommerce data such as deal stages, or purchase pattern as signals to trigger workflows. Workflows are powerful automated marketing campaigns that personalize communications and increase conversion rates. They can be used to perform ecommerce marketing efforts like, abandoned cart nurturing, order process, new customer welcome, re-engagement, and more. Ecommerce marketers using HubSpot and Shopify will have access to transactional email, automation to deliver them, and templates to build them. These emails cannot be marketing unsubscribed and are an important part of building a solid online buying experience that delivers order confirmations and more. You’ll be able to bring orders into HubSpot as deals. Each deal will have associated line items that reference individual products. This lets you organize and analyze purchasing patterns, customer LTV, campaign ROI, other reporting features. It also makes it easy to build lists and segment on order data. 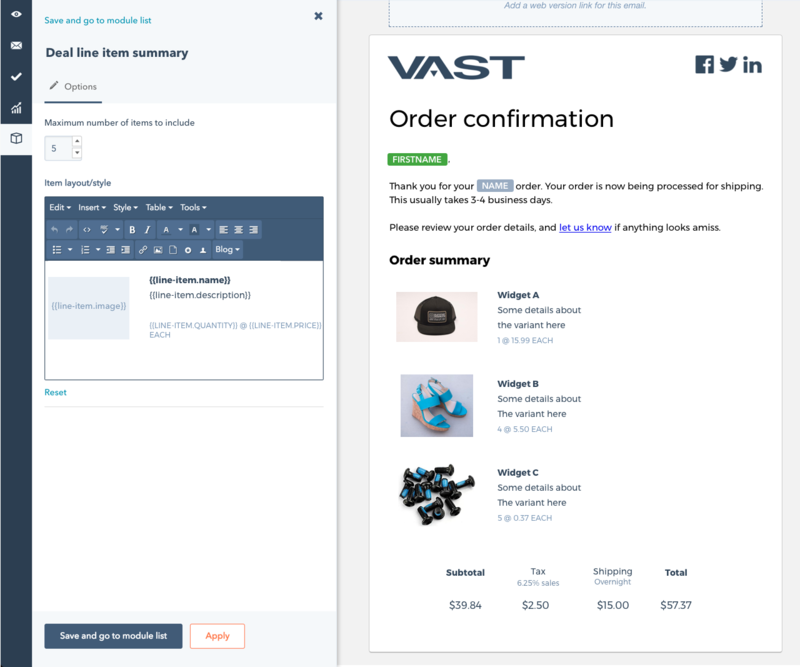 Build lists and segments based on ecommerce signals such as products and categories, deal stages, deal amounts, purchasing patterns, and more. Starting in late Q4 we'll be opening up the beta for Shopify and Bridge to more customers. No change to pricing - Bridge and the Shopify integration are free for HubSpot customers granted they are already a Shopify customers, which is a paid tool. This integration works with all Shopify pricing plans. What languages is this available in?